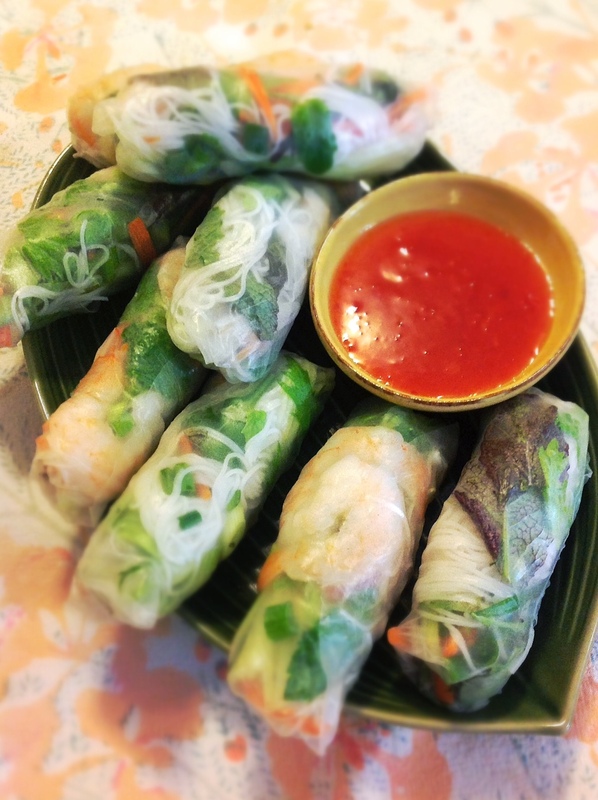 I’ve been on a roll lately – Vietnamese Spring Roll that is. It started because we had one of those wicked curve balls mother nature loves to throw at New England in late spring. Between mud season and summer we get slammed with a few beastly hot days. Hot enough to make your brain so fried you only think about finding a swimming hole and all the ways to not cook dinner. After the mini heat wave I had to make food for a few events where there were folks who couldn’t eat gluten. My answer again was platters of Vietnamese spring rolls. 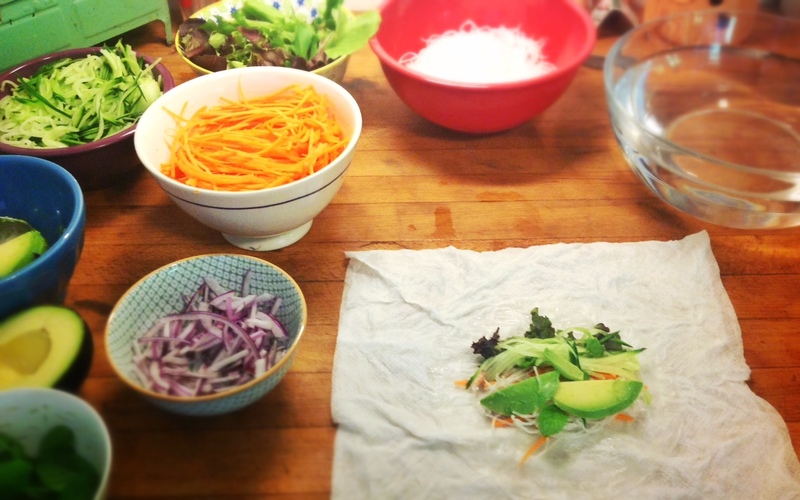 Loads of crunchy vegetables and rice noodles wrapped inside a paper-thin pieces of rice paper. They fit the gluten free (and vegan) needs beautifully. I also love them because similarly to make-your-own pizzas or maple syrup sundaes you can customize them to anyone’s taste. If you make them small enough so there isn’t any double dipping, they are a great addition to a casual outdoor party. You can also eat them with your hands so I give them a high-five for being fabulous finger food! The secret to Vietnamese spring rolls is prep, prep, and more prep. You really can’t start assembling them until all your ingredients are washed, sliced, and diced. I use my Japanese mandoline for much of the julienne work. Mostly my fillings are based on a hunt through the fridge and garden to see what is available at that moment. If I’m out of scallions I use red onion. My son Russell doesn’t like avocados or mint so I leave then out of his rolls. The noodles don’t need to be cooked – just soaked in hot water for several minutes then drained. If the rolls are more of a dinner item than hors d’oeuvre add a little protein with either cooked shrimp or tofu. The possibilities are endless. I find these easiest to make one at a time. I wet some paper towels and place them on my work surface then dip a rice paper into the bowl of water making sure all of it gets wet. Don’t leave it to swim. Just dip in, pull out and let drip, then lay it down on the paper towel. It only takes a few seconds. As it starts softening from the water you can start building. 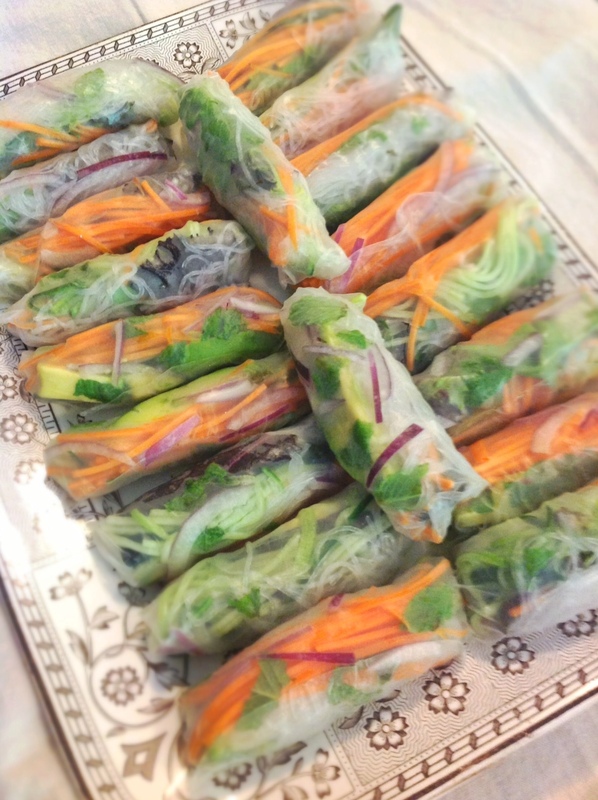 If you want to see a step by step tutorial check out the White on Rice Couple’s blog post on spring roll assembly. I like to close both ends, but if you want to try Diane’s version with one end open go right ahead. Another thing to keep in mind is whatever you put down first will be what shows through the rice paper so if you’re going for pretty build accordingly. It’s a good idea to put some of the softer foods next to the delicate rice paper to minimize (or hopefully eliminate) tearing. Which means save the carrot sticks for the middle. If, despite your best efforts the spring roll tears when your rolling it up then you have cook’s prerogative to taste test. 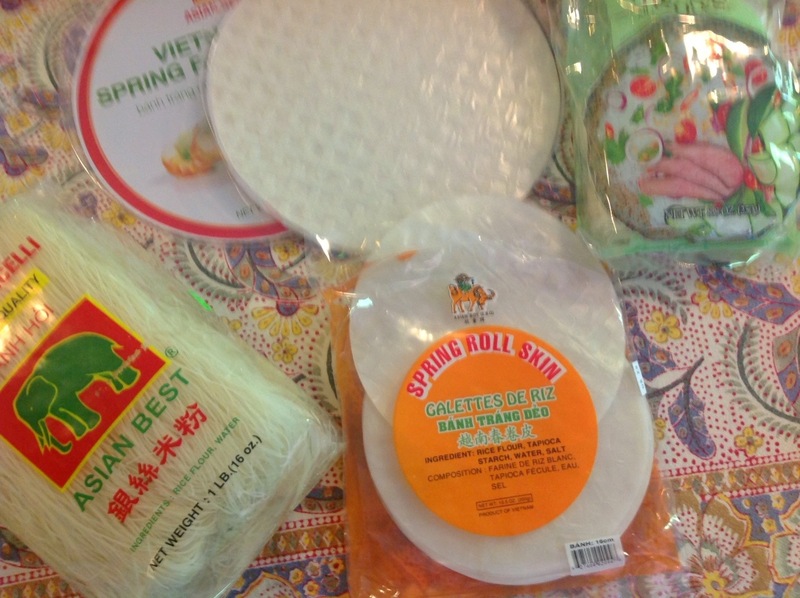 The choices of spring roll skins is pretty vast. I find them at supermarkets, co-ops, natural food stores, and my international market. The skins are hard discs until soaked in water which means when you store them you want to keep them from getting damp, so don’t forget to seal your ziplock bags tight! I’d love to hear what your favorite combinations are. 50years50recipes · Fifty recipes to celebrate my fiftieth birthday.